Time for another edition of What’s On Your Table – Tuesday. I love Joyce’s squares which she is making for a wonderful charity project. What a lovely thing to do! 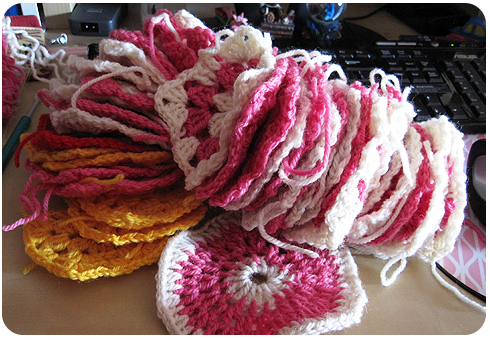 Once my squares are a bit neater, I think I shall make some for the same project. If you want to join in with What’s On Your Table, visit Joyce and don’t forget to say hello! I’ve been a bit behind with posting here lately. Hopefully I will be back into regular posting from now on. There has been a lot of, shall we say, ‘stuff’ going on behind the scenes. I’d rather fluff (especially if it is wool fluff from knitting and crochet) but lately it’s been stuff on my metaphorical table. More fluff, I say! The main crafty thing I’ve been working on is still granny squares. I’m making a lot of pink & white squares plus pink & cream squares for a blanket. I started making random colours because I was just so excited to be able to crochet, but I have now settled into a colour scheme. I just counted my pile of squares – 38! Plus one circle that I made to learn how to crochet circles. The tally of squares does not include my very first square which I want to keep as a special square. Maybe in a crochet/knitting journal. Which I will start one day. Hopefully. Hi Alysha, oh my goodness I have missed you girl. So good to be on here again. I love, love, LOVE whats on your table Tuesday. oh those colours, I can’t wait to see it all together. You are doing fantastically. Don’t worry about getting behind, I have been so busy the last few days and put aside tonight to catch up with my friends. I have missed my blog and chatting catching up with everyone. I have been thinking of you and I hope ‘things’ are going good for you. Take care and keep up those awesome little squares.